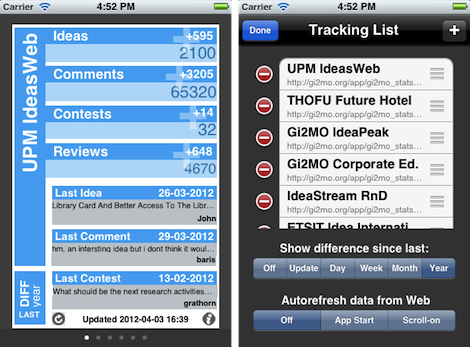 GI2MO Project Homepage » Gi2MO IdeaStream Services and iPhone demo App Released! 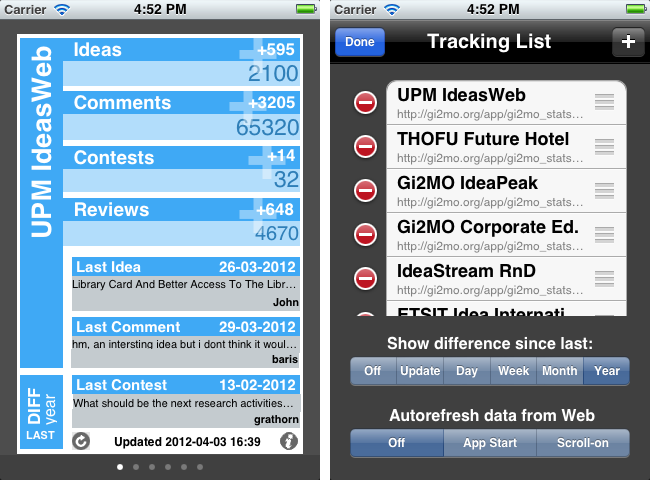 Gi2MO IdeaStream Services and iPhone demo App Released! We are happy to introduce a new concept to the Gi2MO IdeaStream family: customizable data services and rich clients that feed on Idea Management data. To demonstrate the power of new IdeaStream features we have implemented an iPhone application! Gi2MO Stats: instance statistics screen and settings screen (click to enlarge). The Gi2MO Stats app shows how the status of many different Idea Management Systems can be monitored live in a single application using Gi2MO Ontology Model and RDF/XML in the backend. 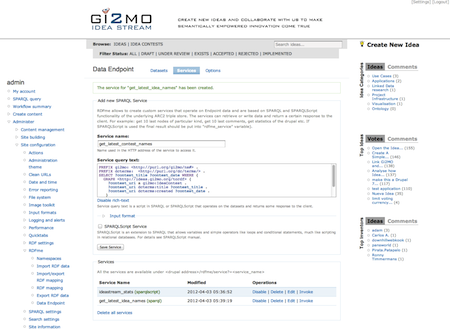 The entire app is heavily immersed in the technological background of Gi2MO research and based on a new concept of IdeaStream Services: customizable REST Web Services that can be configured by the IMS administrator using SPARQL or SPARQLScript queries. The core of server-side functionality is delivered by a new version of RDFme v1.7, while the new update of IdeaStream module automatically installs a number of demo services related to Idea Management. 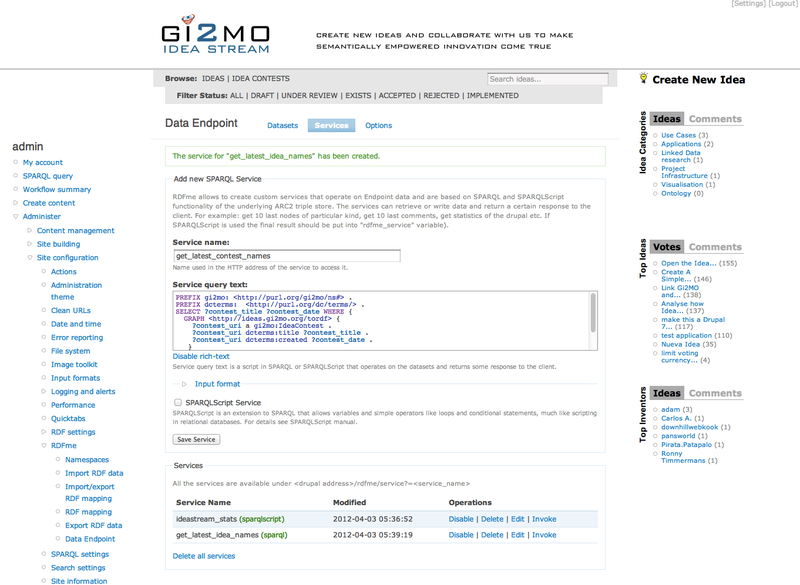 Gi2MO IdeaStream Services: service creation screen (click to enlarge). In summary, the new IdeaStream Services are based on RDFme implementation of a SPARQL Data Endpoint and some custom logic for generating RDF metadata and it’s smart indexing. Think – regular Drupal Search with ability to define custom output and offering metadata browsing as opposed to full-text keyword search. If you would like to know more on how to configure RDFme and start creating new IdeaStream Services head over to the apps section guide. With regard to the iPhone application, We did not put the application in the Apple’s Appstore, therefore a requirement to load it into your devices is having a jailbroken system or an Apple Developer License of your own (so e.g. you can make ad hoc distributions yourself). The code of the application is available as open-source in the apps section.